Anna Rose Beck was born and raised in Austin, Texas, the live music capital of the world, but was a bit of a late bloomer when it came to her musical career. Though she had played cello for three years with her middle school orchestra, Anna Rose’s musical pursuits were pushed aside during her high school years in favor of math and science classes. Her whole life, she had never thought of herself as much of a singer, preferring to sing in the privacy of her car or shower. That all changed in college when she picked up the guitar one summer in the midst of finishing up a bachelor's degree in biomedical engineering at Duke. It was only then that she first discovered her passion and talent for singing and songwriting. 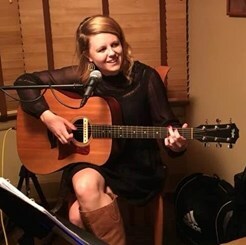 Inspired by the lyrical sensibilities of Bob Dylan and the vocal stylings of Eva Cassidy, Anna Rose began performing in local clubs and music venues after graduation, soon garnering a reputation for her evocative lyrics, hushy middle-soprano intensity, and finger-picked guitar lines. Shortly thereafter, Anna Rose collaborated with Asheville-based producer Andrew Schatzberg to record and release two albums of original songwriting, The Weathermaker (2011) and Glass House (2014). Her voice has been described by music reviewers as “both bold and understated, moving and hypnotic, brimming with passion but never overpowering,” inviting comparisons to Dar Williams and Natalie Merchant. Anna Rose is currently pursuing a master’s degree in Jazz Studies/Vocal Performance at North Carolina Central University, under the direction of the acclaimed jazz vocalist Lenora Helm Hammonds. She has been teaching voice, piano, and guitar for two years, and is living proof that it is never too late to learn to sing and play music! While teaching voice is her main specialty, Anna Rose prefers a dual approach to voice and instrumental lessons, believing that students will find much more satisfaction in their singing and a greater understanding of music if they learn to self-accompany themselves on an instrument. Although she is not classically trained, she works with students of all ages on popular styles of music: jazz, folk, country, Americana, rock, and pop are her specialties. She believes that students should love the songs they are learning to play, as this is the only way to ensure that they will practice -- and also that they won’t be able to stop! Anna Rose is also passionate about songwriting and loves to help any students who are interested in writing develop the lifelong ability to write their own songs. Anna Rose performs regularly throughout the triangle as part of a jazz duo with guitarist Nelson Johns, and as a member of an all-female folk trio, The Gingersnaps. In her free time, she is learning to play the fiddle and enjoys doing yoga and riding her bike. Request Lessons with Anna today!